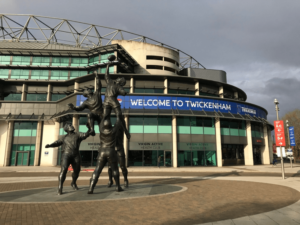 Twickenham Stadium is best known as the place where rugby supporters go to roar on fifteen athletes wearing white and red. But a very different kind of crowd is pouring through the doors at this illustrious venue today. The scarves are swapped for lanyards and the singing is substituted for speeches, although the stadium mindset is much the same as you’d find on a weekend: everyone has come to Twickenham to see something special. 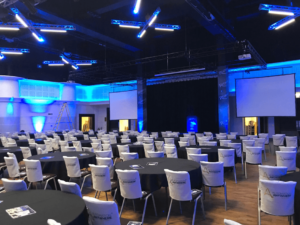 On this chilly autumn morning, the famous arena is playing host to the third edition of Intelligent Automation Week – the UK’s biggest gathering of enterprise and business leaders. From the word go, IA Week is buzzing with activity. 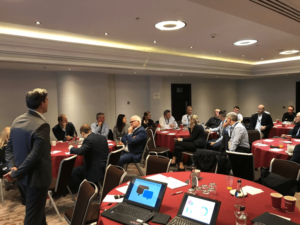 Meeting rooms are awash with tech talk as the likes of Baringa Partners, Kryon, Camunda, Redwood Robotics and Thomas Cook host interactive workshops that paint a clearer picture of RPA’s benefits for businesses. On the ground floor, the exhibition hall is packed to the rafters with fizzing lights and glowing monitors. At the back of the room stands a trio of cartoon robots – one of which is cradling a rugby ball. The text above them reads: “Robiquity …we TRY harder”. It’s a playful image that sends a smile across the face of each bystander – but it’s also a reflection of what Robiquity are all about. Whether it’s fine-tuning branding for a sports stadium-based event or serving up scalable, tailored RPA solutions, Robiquity know exactly what’s needed in every business environment and offer the perfect approach. 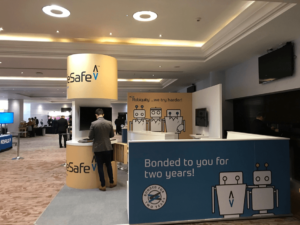 Hundreds of business owners are drawn to the Robiquity exhibit over 48 hours, and whilst most appreciate that RPA is the future, each is on a different path to embracing it. Some admit they are still familiarising themselves with the concept. Others explain how they’ve tried and failed to implement RPA through other means. Several say they are already well versed and want to take things up a notch. 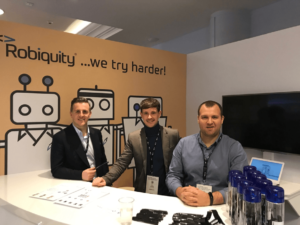 Throughout the conference, Robiquity’s Tom Gardner, Jack Rimmer and Bobby Nastase emphasise that, whatever stage you might be on your journey, Robiquity offer the enablement, education and delivery of RPA to help. 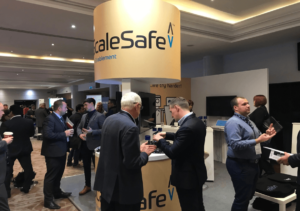 The team also explain how RPA enablement and implementation is made possible through ScaleSafe: a patented model providing free onsite mentoring and continued aftercare. As part of this solution, team members are committed to projects (and protected against poaching) for up to two years. This means businesses can embed a crucial sense of stability within their organisation when it comes to RPA. These exhibition stand conversations also reveal how Robiquity’s role at IA Week is multifunctional. 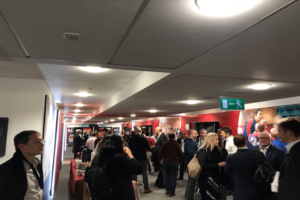 The team are in Twickenham to show people what they can offer, network with fellow professionals and support the tech community…but they’re also here to help break down RPA (a fast-moving and complex industry) into bite-sized chunks. 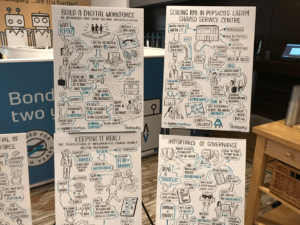 Tom, Jack and Bobby take the time to put processes like RPA scaling, digital workforce building and machine learning into layman’s terms, with the explanations aided by a series of RPA cartoon storyboards (which prompt dozens of attendees to whip out their cameras and take a few snaps). IA Week is all about revelations – enlightening ticket-holders to the possibilities and realities of modern tech. 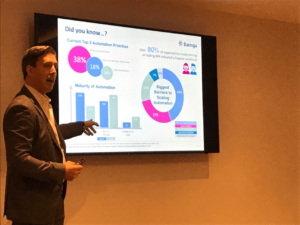 The very first workshop, hosted by Robiquity’s good friends Baringa Partners, perhaps shares the most revealing statistic of all: 80% of organisations implementing RPA indicated a happier workforce. This debunks the prevalent myth that robots are set to steal everyone’s jobs, yet a recurring paradox springs up across the course of the conference. Despite endless evidence that a hybrid workforce working in harmony is achievable, thousands of businesses all over the world are yet to adopt RPA technology. IA Week proves time and time again that so-called “emerging” technology trends (like RPA, AI and machine learning) aren’t the new kids on the block anymore. They’re integral elements in a progressive, forward-thinking business strategy. But there is a reluctance and hesitancy to implement RPA – which stems from poor understanding, skills shortages, and lack of vision. Ultimately, these findings place fresh emphasis on the importance of IA Week and businesses like Robiquity. Both enable companies to acquire knowledge, meet expert talent, and realise their firm’s place in the future industry. As Wednesday evening rolls around, the dismantling of the exhibition stands signals the end of the conference. The Robiquity team take a moment to reflect on IA Week 2018, as well as what the future holds. “It’s great to be back at IA week 2018 for the second year running,” explains co-founder Tom. “It’s a fantastic event with one of the most focused audiences within the industry. “What’s clear is that the market is most certainly increasing as it drives towards a wider adoption of automation technologies. “That said, whilst RPA sales are up dramatically, many businesses are still struggling to scale out their programmes. “This is where Robiquity excels: as a pure play RPA delivery partner. Co-founder Jack also believes IA Week helped highlight the direction in which the market is moving. “It’s really interesting to see the progress of the RPA & AI market,” he states. “We’re now starting to see clients reach a level of maturity where they can truly scale their capability beyond the Pilot/Initialise/CoE setup phases. “Over the previous few years, the leaders we’ve met in this space have been asking how to get RPA off the ground. Things are different today; RPA is familiar now. Yes, they have the challenge of scaling – but leaders are also looking for the next tech enabler which can unlock efficiency opportunities which RPA can’t handle on its own. “For us, the challenge is helping clients walk before they try running. By immersing themselves in events like IA Week, Robiquity keep their finger on the pulse of a fast-moving industry, maintaining their ability to provide up-to-the-minute, high-quality services. Through the ScaleSafe model, Robiquity can produce a team to help maximise ROI and develop your very own RPA centre of excellence. They also supply talent on a permanent or contract basis, as well as access to an online forum where industry members hold some of the most important discussions around training, market developments, and RPA roles. Through specialised enablement and implementation procedures, Robiquity give clients the foundation, tools and ownership of a certified RPA capability system – creating an opportunity to take advantage of top tech and push forward in the digital age. You can find out more about how Robiquity can help your business right now. All you need to do is get in touch on 0161 974 3244 or info@robiquity.com.